A pizza stone is a great tool to have in your kitchen at home if you're a pizza lover. The hard, porous material heats evenly in the oven and absorbs oil and moisture, giving the pie an evenly cooked, perfectly crisp crust every time. Here are the best practices for using and caring for a pizza stone. Pizza stones may be made from heavy stone or ceramic material, but they're actually quite delicate in nature. Sharp changes in temperature can shatter them. Before using a pizza stone, brush it off with a dry cloth. Place the stone in a cold oven, then turn on the heat. Letting it heat with the oven decreases the risk of thermal shock. Generally speaking, pizza stones should not be treated with oil or nonstick spray. Homemade and frozen pizzas can be heated on a pizza stone. 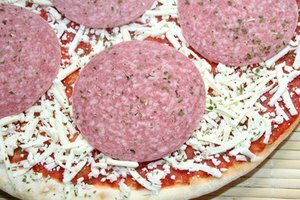 If making a frozen pizza, slide the pizza straight onto the cold stone, then turn on the oven. 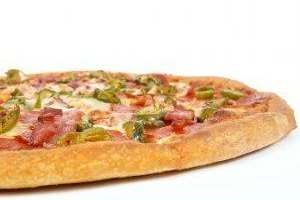 Placing icy pizza on a hot stone could buckle the stone. 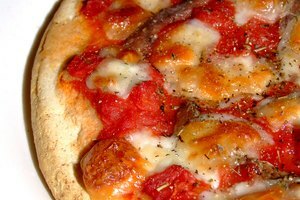 If making a homemade pizza, prepare it as you normally would. Sprinkle a bit of cornmeal onto the heated pizza stone, then slide the pizza onto the stone using a pizza peel. A peel, which is shaped like a paddle, is necessary because the stone will be far too hot to handle. Sliding out the oven rack to place the pizza on the stone is also dangerous, as the rack may not be able to fully support the weight of the heavy stone. Bake the pizza for the recommended amount of time, but check on it every five minutes or so to make sure the bottom isn't burning. To remove frozen or homemade pizza, slide the pizza peel between it and the pizza stone and lift it out of the oven. Never cut a pizza on a pizza stone, as this can damage the stone. Before cleaning the stone, it's important to let it cool naturally. Turn off the oven and remove the stone using either the pizza peel or some heavy-duty heatproof gloves. Remember that the stone will be very heavy and hot; it can easily transmit heat through thin potholders. Place the pizza stone on a heat-resistant surface and let it cool completely. This may take a few hours, but it's necessary to keep the stone from breaking. After the stone is cool, lightly scrub the surface with a stiff, dry brush. If desired, wipe it down with a damp cloth. Since pizza stones absorb moisture, they should never be submerged in water or cleaned with soap. Washing the stone can also ruin the natural seasoning it absorbs from oil. Wisegeek: What Is a Pizza Stone?